11:0.2 The material beauty of Paradise consists in the magnificence of its physical perfection; the grandeur of the Isle of God is exhibited in the superb intellectual accomplishments and mind development of its inhabitants; the glory of the central Isle is shown forth in the infinite endowment of divine spirit personality —the light of life. But the depths of the spiritual beauty and the wonders of this magnificent ensemble are utterly beyond the comprehension of the finite mind of material creatures. The glory and spiritual splendor of the divine abode are impossible of mortal comprehension. And Paradise is from eternity; there are neither records nor traditions respecting the origin of this nuclear Isle of Light and Life. 11:2.3 These differences in dimensions, taken in connection with its stationary status and the greater out- pressure of force-energy at the north end of the Isle, make it possible to establish absolute direction in the master universe. 11:2.9 The eternal Isle is composed of a single form of materialization—stationary systems of reality. This literal substance of Paradise is a homogeneous organization of space potency not to be found elsewhere in all the wide universe of universes. It has received many names in different universes, and the Melchizedeks of Nebadon long since named it absolutum. This Paradise source material is neither dead nor alive; it is the original nonspiritual expression of the First Source and Center; it is Paradise, and Paradise is without duplicate. 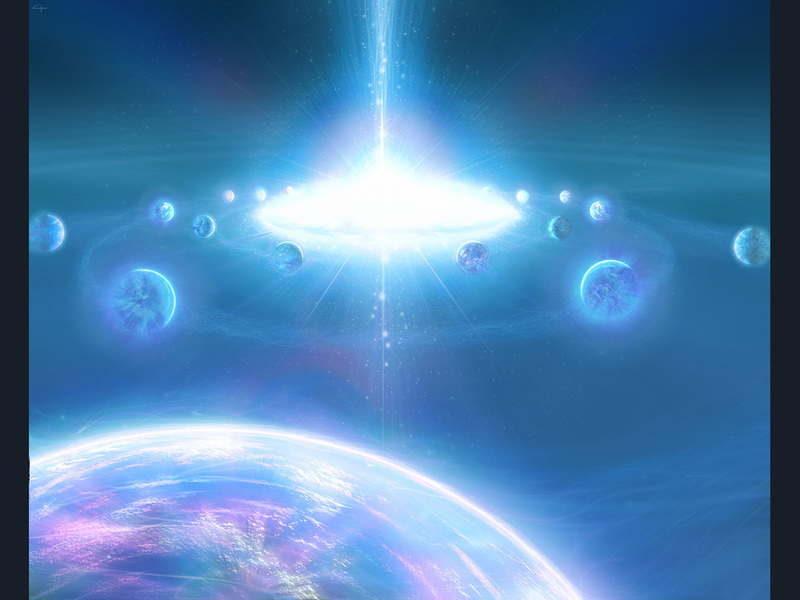 11:2.10 It appears to us that the First Source and Center has concentrated all absolute potential for cosmic reality in Paradise as a part of his technique of self- liberation from infinity limitations, as a means of making possible subinfinite, even time-space, creation. But it does not follow that Paradise is time-space limited just because the universe of universes discloses these qualities. 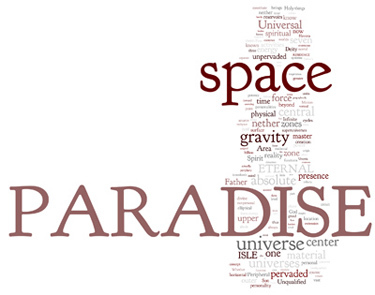 Paradise exists without time and has no location in space. 3. Occupying the outer margins of the under surface is a region having mainly to do with space potency and force-energy. The activities of this vast elliptical force center are not identifiable with the known functions of any triunity, but the primordial force-charge of space appears to be focalized in this area. This center consists of three concentric elliptical zones: The innermost is the focal point of the force- energy activities of Paradise itself; the outermost may possibly be identified with the functions of the Unqualified Absolute, but we are not certain concerning the space functions of the mid-zone. 11:7.3 The vertical cross section of total space would slightly resemble a Maltese cross, with the horizontal arms representing pervaded universe space and the vertical arms representing unpervaded (reservoir) space. The areas between the four arms would separate them somewhat as the midspace zones separate pervaded and unpervaded space. These quiescent midspace zones grow larger and larger at greater and greater distances from Paradise and eventually encompass the borders of all space and completely incapsulate both the space reservoirs and the entire horizontal extension of pervaded space. 11:8.8 Space potency is not subject to the interactions of any form of gravitation. This primal endowment of Paradise is not an actual level of reality, but it is ancestral to all relative functional nonspirit realities—all manifestations of force-energy and the organization of power and matter. Space potency is a term difficult to define. It does not mean that which is ancestral to space; its meaning should convey the idea of the potencies and potentials existent within space. It may be roughly conceived to include all those absolute influences and potentials which emanate from Paradise and constitute the space presence of the Unqualified Absolute. 11:9.4 When reality is differentiated into the personal and the nonpersonal (Eternal Son and Paradise), it is hardly proper to call that which is nonpersonal "Deity" unless somehow qualified. The energy and material repercussions of the acts of Deity could hardly be called Deity. Deity may cause much that is not Deity, and Paradise is not Deity; neither is it conscious as mortal man could ever possibly understand such a term. 11:9.5 Paradise is not ancestral to any being or living entity; it is not a creator. Personality and mind-spirit relationships are transmissible, but pattern is not. Patterns are never reflections; they are duplications—reproductions. Paradise is the absolute of patterns; Havona is an exhibit of these potentials in actuality. 11:9.6 God's residence is central and eternal, glorious and ideal. His home is the beauteous pattern for all universe headquarters worlds; and the central universe of his immediate indwelling is the pattern for all universes in their ideals, organization, and ultimate destiny. 11:9.7 Paradise is the universal headquarters of all personality activities and the source-center of all force- space and energy manifestations. Everything which has been, now is, or is yet to be, has come, now comes, or will come forth from this central abiding place of the eternal Gods. 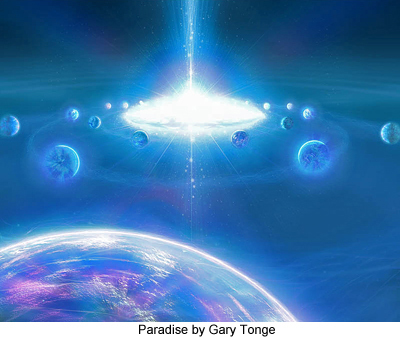 Paradise is the center of all creation, the source of all energies, and the place of primal origin of all personalities. 11:9.8 After all, to mortals the most important thing about eternal Paradise is the fact that this perfect abode of the Universal Father is the real and far-distant destiny of the immortal souls of the mortal and material sons of God, the ascending creatures of the evolutionary worlds of time and space. Every God-knowing mortal who has espoused the career of doing the Father's will has already embarked upon the long, long Paradise trail of divinity pursuit and perfection attainment. And when such an animal-origin being does stand, as countless numbers now do, before the Gods on Paradise, having ascended from the lowly spheres of space, such an achievement represents the reality of a spiritual transformation bordering on the limits of supremacy.